A Google balloon, part of the company's high-speed Internet service known as "Project Loon", crashed in a Sri Lankan tea plantation during its maiden test flight, local police said Thursday. 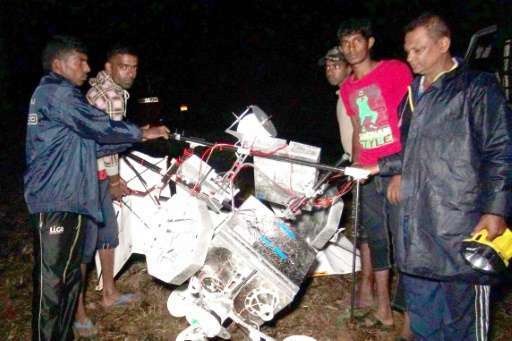 Villages found the deflated balloon with its electronic equipment in the island's central tea-growing region of Gampola on Wednesday night, an officer told AFP. "Tea plantation workers found it crashed in the plantation. They picked up the pieces and brought it to the station," the officer, who is not authorised to speak with media, told AFP by phone. However Sri Lanka's Information and Communication Technology Agency, which is coordinating the tests with Google, described the landing as controlled and scheduled. "Google loon balloon safely landed under standard operating procedures in as a part of the test," ICTA chief Muhunthan Canagey said on Twitter. The ICTA declined to comment to AFP on details of the landing which had not been previously announced. The government announced earlier this month it would take a 25 percent stake in the joint venture with Google. Sri Lanka is not investing any capital, but will take the stake in return for allocating spectrum for the project. Less than one quarter of Sri Lanka's more than 20 million-strong population has regular access to the Internet.